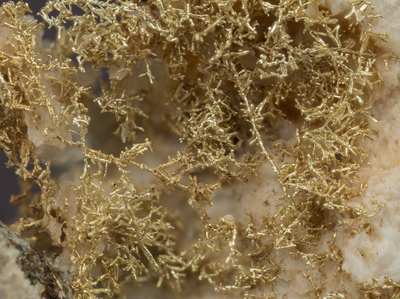 This area of wire gold, which is anchored to laumontite, appears more yellow than wires that were covered by calcite. Semi-quantitative SEM/EDS analysis indicates the Au/Ag weight ratio is almost exactly 2:1. Laumontite was identified by SEM/EDS and is probably white due to dehydration. 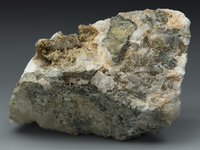 Additional laumontite, when exposed by dissolving away calcite, is transparent.